Those who work in the addictions field know the importance of having their “tools” in one easily identifiable location. 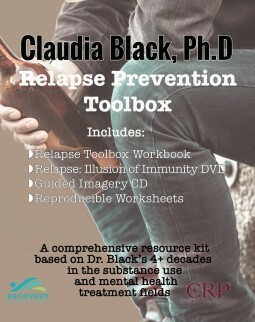 The Toolbox Bundleincludes all 4 toolboxes: Anger Toolbox, Depression Toolbox, Family Toolbox and Relapse Toolbox. And you save by purchasing all 4 together. Each toolbox contains a Strategies Book, CD and DVD all in a specially designed box to keep them readily available. Each book offers hands on practical strategies that can be used with individual clients or within a group, didactic information to be used in sessions, reproducible handouts with no copyright restriction, and specific instructions for assignments. The handouts are in the form of written exercises, checklists, sentence stems, structured dialogues and/or art activities and are an integral part of the therapeutic process. Each audio CD is a combination of relaxation and meditation visualizations. Each DVD is specific to the individual Strategies Book and is approximately 30 minutes long. Click the button below to add the Toolbox Bundle All 4 Toolboxes to your wish list.